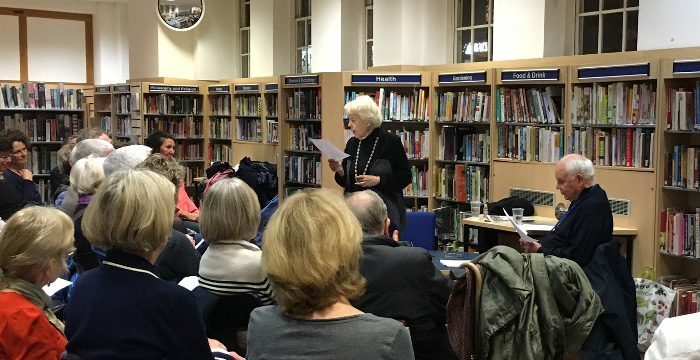 Just as the camp monthly quiz night in the Sherriff Centre, which caters to the 20-somethings, was getting started, the Friends of West Hampstead Library were kicking off their ‘evening of Hampstead poetry’, which seemed to appeal to a more mature audience. I’d been to the last quiz (and really enjoyed it), so it seemed time for some poetry. The evening was organised by the FoWHL and Ted Booth, who is writer in residence at the Library. He was joined for the readings by local councillor and former actress, Flick Rea. Ted is a long-standing West Hampstead resident and a generous, gentle guy. And quite a good poet to boot, so it was no surprise that there was full house for the evening. Ted structured the evening as a programme of a dozen or so loosely linked poems, all by poets from Hampstead and its surrounds. If the poets were local, the poems ranged far and wide. A Year in London by Tobias Hill (formerly of Minster Road) took us on a journey down the Kilburn High Road, while Coming Back by Al Alvarez, and Autumn in Toas by DH Lawrence took us all the way to New Mexico. We returned close to home with two poems of the same name, Parliament Hill Fields, by totally different poets: Sylvia Plath and John Betjeman. Ted said it would take a consummate actor to do both of them justice, but fortunately we had Flick on hand – and even with a nasty cough – she performed with gusto. Earlier on she had read Portrait of A Barmaid, by Edith Sitwell, which Ted felt was surreal, but Flick just weird! Also in the programme were two works by Owen Sheers, a welsh poet who, like Tobias Hill is both a poet and author. The first, Mametz Wood, takes us back exactly 100 years to the battle of the Somme. The second , Coming Home, is about the awkardness of returning to the childhood home as an adult. Good stuff, and someone new to me. The short evening ended with The Mission Jazz Band, written by Ted himself and recited by him and Flick. 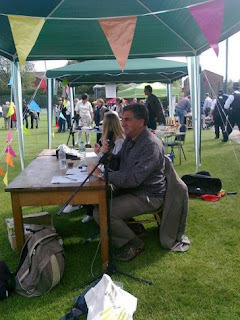 It was the lightest poem of the evening and brought back memories of warm summer afternoons in Golders Hill Park. Ted left us with some questions to ponder, what did we think of the evening? What did we think of the poems? I’m glad I went; it was a pleasant evening, it’s good to try something different and don’t we all, young or old, need a bit more poetry in our lives? 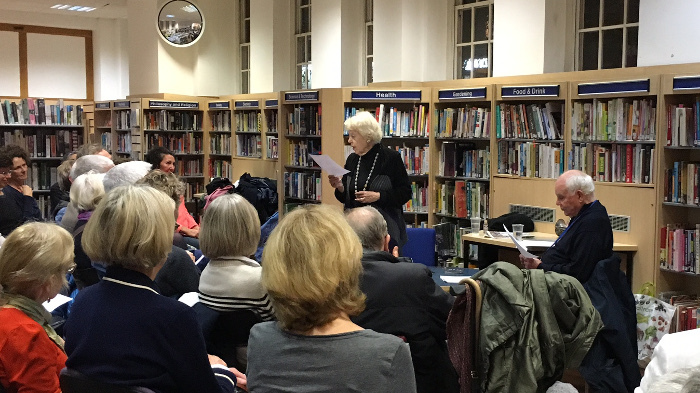 Is West Hampstead library at risk?